Hi, I’m Kay Williams. Today I’m joined by Julie Hatcher Director of SAM programmes at Madora consulting. 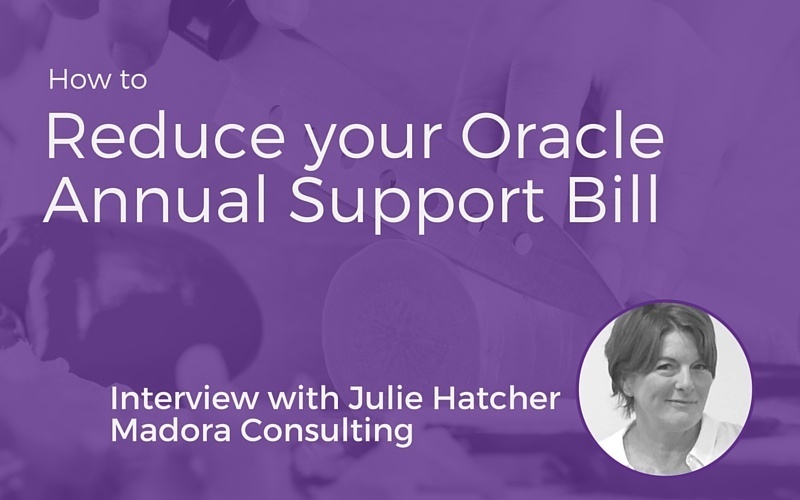 One area that Madora specializes in is advising Oracle customers on how they can reduce their Oracle annual support bill. Can you just run through some general advice and some tips that you would give an Oracle customer who is looking to reduce their annual support renewal? Another thing to ask is “do you check each renewal, or are you always assuming that your renewals are correct?” and “do you have the resources and time to be able to spend this time checking your renewals?” This can be quite time consuming, and if you buy piecemeal throughout the year you may have several renewal dates and you may have various different departments purchasing outside of a central contract in many different countries. This is an area where you could use some help, like ourselves, someone like Madora Consulting who can help with checking these support renewals. Talking about the renewals more in detail, these are usually sent out by Oracle three months before the renewal date and they require renewal 30 days before it’s due to start. Some of the information that’s included on the renewal: customer details, products, metrics, the term, usage levels, dates of renewal and expiry dates, and then of course the fees required. Always check that the renewal is correct, check that the quantities on the contracts and the renewals match, are the metrics that are shown on the renewals correct, and what is the percentage increase on last year’s renewals? Generally, I think for Oracle it tends to be 3%. Another area to check is are you still using the licenses? Do you know whether you still need to use them going forward? This is another area that could be quite time consuming, so do you have the resources to investigate? And again, this is an area that Madora can help you with. I suppose generally people just assume that the annual support renewals are correct and pay the bill and sign on the dotted line? Yes, especially when you’ve got quite a few. Again, as I say, if you are buying, numerous times throughout the year you will get quite a few renewals that come in, could be very large ones so could be quite time consuming to check each item and check that they’re correct, so in a lot of cases you may just be paying them. When you go to an Oracle customer and you check their renewals, do you often find there’s a big discrepancy? Yes. Sometimes it could be that the product quantities don’t match, so you may be paying renewal on quantities of products that you didn’t buy, also it’s worth checking the uplift on last year, that that’s not more than what’s expected. The other main area as well is are you still using all of those products? Some of the changes that you can make, I’ve worked with customers before who have set purchase dates throughout the year, to avoid buying piecemeal and having several renewal dates. They’ve agreed with Oracle to purchase at certain times throughout the year, so that reduces your number of renewals, and also to pro-rate their year two support so that they just have one large renewal each year so you’ve only got one to check. Again, these customers also have one contract that all their Oracle licenses are purchased on across all departments and countries, so that makes it easier to check as well. You mentioned the uplift, Julie, is that a set percentage? It tends to be 3%, and again I have known customers that negotiate that uplift, and that’s probably something that we could help with as well. And that’s negotiated at the initial contract stage, is it? No, I’ve seen that negotiated at the time of when the renewal’s being checked, so I have customers who have negotiated that uplift at the time of the renewal. I have to say, they are a very large customer, so that might have had some sway on that. I’m not always saying that it’s successful, but it’s one to consider. Any other advice on reducing an annual support bill? There is a rise in companies offering alternative support to Oracle, such as Spinnaker. I know that these may be better utilized for Oracle customers running older versions of database, and not necessarily intending to upgrade the version, but it’s definitely an option that’s worth spending some time looking into. What I would also say is work with Oracle to cancel support on products you are not using, and as this process can be complex, Madora Consulting have been through this many times and we can offer advice at any point, whether it’s checking renewals, helping you to carry out an inventory review, or even just working with Oracle on your behalf negotiating rates. When you’re instructed by an Oracle customer, you generally save them money? Yes, there’s not always the leeway to be able to do that, but yes we can definitely look at all these areas and look whether there’s any potential savings that can be made. Kay:	Okay, thank you, Julie. The process sounds pretty complex, so if any listeners want further advice on how to reduce their annual support renewal, they can contact you via the Madora.co.uk website, or myself, and they can book a free consultation with you. Julie:	Yes, at any point through that process, whether it’s checking their renewals, checking their inventory, or just wanting some general advice really. Kay:	Okay, thank you very much, Julie. Can you cancel an Oracle ULA?